Frenchman Jo-Wilfried Tsonga edged past his compatriot Gilles Simon 6-2 7-6 (7-3) after 1 hour and 34 minutes to score the ninth win in their career 12 head-to-head matches. Tsonga fended off four of the five break point chances he faced and converted three of his six break points. Tsonga won 17 of his first 21 break points and broke serve twice to race out to a 4-0 lead. The player from Le Mans hit a service winner in the eight game to seal the first set 6-2. Both players traded breaks at the start of the second set. Simon kept pace with Tsonga en route to the tie-break. Tsonga cruised through to a 7-3 win in the tie-break. “I am very happy to win this match. It was something great at a good level. I hope I will be able to go far in this match”, said Tsonga. 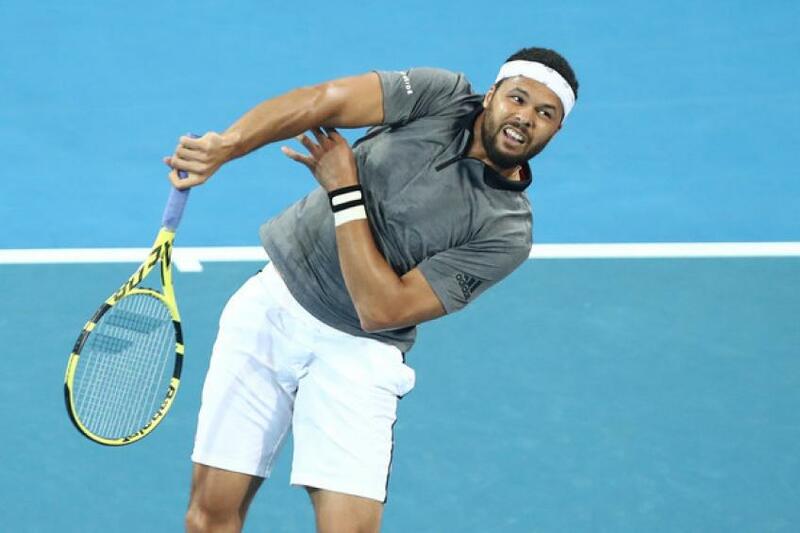 Tsonga will face this year’s Brisbane semifinalist Jeremy Chardy, who converted four of his five break points in his 6-3 7-5 win over French qualifier Antoine Hoang. Filip Krajinovic beat David Goffin 6-4 6-4 in one hour and 28 minutes to secure his spot in the quarter final. Krajinovic broke serve twice and saved all four break points he faced. Krajinovic got an early break in the first game with a backhand down the line winner. The Serbian player saved two break points in the next game and never looked back in his next service games to win the first set 6-4. Krajinovic went up a set and a break in the first game, when Goffin made a backhand error. He did not convert four break points before facing two break points in the eighth game, but he saved them. Goffin saved a match point at 3-5, when Krajinovic hit a forehand into the net. Krajinovic held serve at 15 with a service winner to secure his spot in the quarter final. Tomas Berdych won eight consecutive games from 4-2 in his 6-2 6-0 win over Benoit Paire in just 58 minutes. The Czech player saved both break points he faced and converted five of hi sten break point chances. Berdych saved a break point at the start of the match. He fended off another chance in the third games with a service winner. Berdych broke serve at 15 in the fourth game. He went up a double break, as Paire serving to stay in the set at 2-5. Berdych got an immediate break at the start of the second set and got two more breaks to reel off the final five games. Marcos Baghdatis beat Belgian lucky loser Ruben Bemelmans 6-2 6-4 setting up a match against defending champion and 2019 Australian Open semifinalist Lucas Pouille. Ilya Ivashka came back from one set down to beat Italian player Thomas Fabbiano 4-6 6-4 6-3.